$8 – Only if you or the person you’re getting your twigs from doesn’t already have a pair or can’t snap off the twigs easily. Rabbits are always grazing! In the wild they would forage for berries, herbs, veggies and grasses and nibble on yummy twigs! Anyone with a rabbit knows they love to chew! Twigs from apple trees are an excellent natural treat for your rabbit to gnaw on! It keeps them busy and helps to keep their teeth moving. Rabbit’s teeth never stop growing so hard twigs are a great essential to help them stay healthy and short. 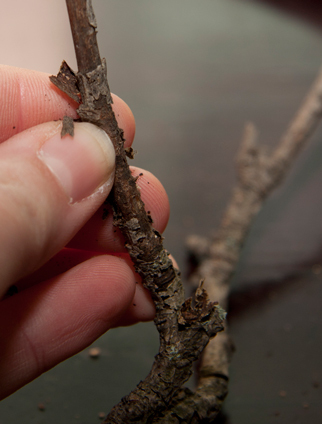 Do not take twigs from trees that have been sprayed with pesticides. If your rabbit ingests these, it could be fatal to them. Where do you find an apple tree? It may be easier than you think! First think, do you know anyone with an apple tree? Many older homes with larger backyards have fruit trees growing in them. We got our twigs from my Aunt’s backyard but there’s also a place at our local Conservation Area with lots of yummy apple trees that are definitely not treated with any chemicals. If you start mentioning it to family and friends, they might even know someone who wouldn’t mind you cutting off a few small branches here and there. Since you’ll be cutting them up in to small three inch sections or so a few good branches will go a long way! 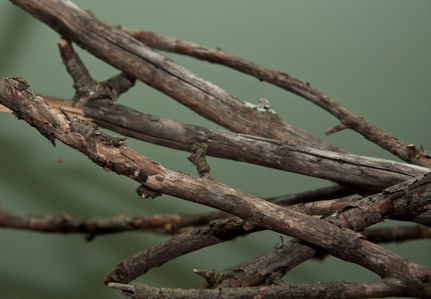 Choose twigs that look nice and healthy for your rabbit! One of the great things about apple twigs is that you don’t have to let them dry for a few months before they are safe for your rabbit to eat. If you have let them dry out like me, that’s okay too, you may just need to remove that messy outer layer of bark before giving them to your rabbits! The other great thing about this project? A little goes a long way! If you choose a longer, narrower branch, by the time you cut it all up, you’ll have an abundance of apple sticks! Start by using your fingers to brush off that extra layer. You may also use a box cutter to help with this part. I used my thumb to rub off any really loose areas and the box cutter just to smooth out any rough patches that were left behind. You don’t need to worry about getting rid of all of the bark, your bunnies will love it, but it makes it cleaner if there’s not loose pieces hanging off here and there! Once you’ve brushed off that icky layer, cut your twigs into smaller three or four inch sticks, perfect for your rabbit to toss around and easy for them to nibble on. 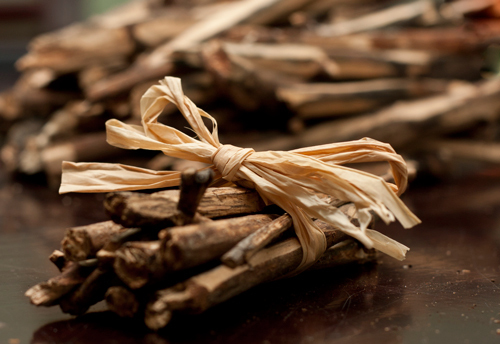 Make it more exciting for your rabbit by wrapping up a small bundle of sticks with raffia or twine so it becomes a game to break up the twigs! Your rabbit will love it! What twigs need to be dried out in order to be safe for the bunnies? As far as I know, you can use fresh willow, pear and apple twigs that have been untreated with pesticides. Cutting a few snips with leaves are a great option too! None of these need drying out, maybe just a good rinse to make sure any dirt is washed off beforehand but you can also dry them out and save them for later (like in the winter months when trees aren’t blooming). As always these are a treat so I wouldn’t give them every day, apple trees contain cyanide in their branches and leaves (although it’s usually found in the seeds) and willow is a natural aspirin containing salicin. As always treats are good in moderation. I also love to give my rabbits pinecones which should always be dried by leaving them for a few weeks after I’ve scrubbed them clean and then popping them in the oven and baking them for about 45min. I would avoid all other fruit trees like apricot, cherry and peach because they produce larger pits and larger quantities of cyanide making them poisonous to your rabbits. What about maple, alder, birch and the softwoods? From what I’m aware of, alder, birch and maple are indeed safe however I’ve never actually given them to my rabbits. I would stick to twigs only, cleaned thoroughly and in moderation. Softwoods are most definitely not save! In fact cedar and pine shavings have been documented as causing problems with rabbits and other small animals liver enzymes so I would definitely steer clear of those in both fresh branches as treats and as bedding! Thank you! I have lots of pesticide-free apple trees and wasn’t sure how to prep the twigs for my bunny.